1. It was not long ago when the Business Council of Alabama (BCA) was in turmoil as a result of its leadership and direction. A group of its key members took a stand, changes were made, fences were mended and the BCA brought in Katie Boyd Britt to reinvigorate its membership and fortify its position in the areas of politics and public policy. The turnaround has been strong and immediate. 2. The intrigue surrounding Alabama’s 2020 U.S Senate race has spiked in recent days. Yellowhammer News wrote last week of the D.C. interest group Club for Growth’s recruitment efforts in the state. Announced candidate Congressman Bradley Byrne (AL-01) continues to move around the state, and it sounds as if other potential candidates continue assessing the race. A source close to Lt. Governor Will Ainsworth said that he is actively considering his options. The source said Ainsworth is bringing a team in next week to conduct a comprehensive assessment of the race and what a campaign could look like. We’re told financial backers have conveyed their ardent interest in an Ainsworth candidacy should he decide to run. Someone familiar with Congressman Gary Palmer’s (AL-06) thinking told us that he continues to feel no pressure to make a decision any time soon. We hear he remains cognizant of what it could mean for the seat he currently occupies and its legacy if he chose not to seek re-election to the House. Palmer has faced only nominal opposition in his seat since his 2014 victory over former state House member Paul DeMarco in the Republican primary runoff. A source with direct knowledge has confirmed to Yellowhammer News that former Auburn football coach Tommy Tuberville is now past seriously considering a Senate bid and is “all-in” on entering the race. He has been active in traveling the state and speaking to various civic and political organizations over the last few months, including being spotted at the ALGOP Winter Dinner by Yellowhammer News in February. 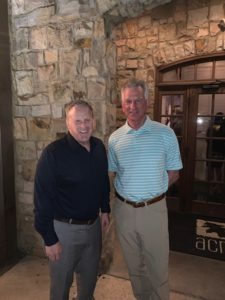 Do not be surprised if Tuberville makes an announcement this month, as he has been meeting with national consultants and is currently focused on compiling a first-class campaign team. He even recently visited with former White House Press Secretary Sean Spicer. 3. Speaking of potential Republican candidates to challenge Sen. Doug Jones (D-AL) in 2020, the out-of-the-blue news that Congressman Matt Gaetz (FL-01) is considering moving across the state line into Alabama to mount a bid has Democrats in Washington, D.C. giddy about their newfound opportunity to keep the Senate seat blue. Sources inside the Beltway tell Yellowhammer News that national Democrats would do everything in their power to get Gaetz nominated if he does decide to enter the race. After all, Jones’ best shot at convincing enough Alabamians to vote for him to stay in his seat would be running against someone who is not an Alabamian. Yellowhammer State Republicans have expressed similar sentiments and are worried that a Gaetz candidacy would torpedo what should be a clear-cut general election against Jones. 4. Former Attorney General Troy King made an appearance at the Alabama statehouse this week. King attended a Senate committee meeting involving the competing lottery bills. Observers saw King conferring with Greene County elected officials who were at the meeting advocating on behalf of smaller electronic bingo operators. Yellowhammer News contacts in the legal community have told us they believe King has advised clients in Walker County, as well. Walker County was the site of a recent raid by law enforcement on a newly-established electronic bingo parlor. 5. The race for Alabama House District 74 is shaping up. This is the seat that became vacant after the sudden passing of beloved State Rep. Dimitri Polizos (R-Montgomery). Former House candidate Charlotte Meadows officially announced her candidacy on Friday. Meadows is known to be a staunch school choice advocate and could draw the fire of the Alabama Education Association (AEA) in the race. Daniel Sparkman, Governor Kay Ivey’s press secretary, is expected to enter the race in the coming days and will be a formidable candidate.